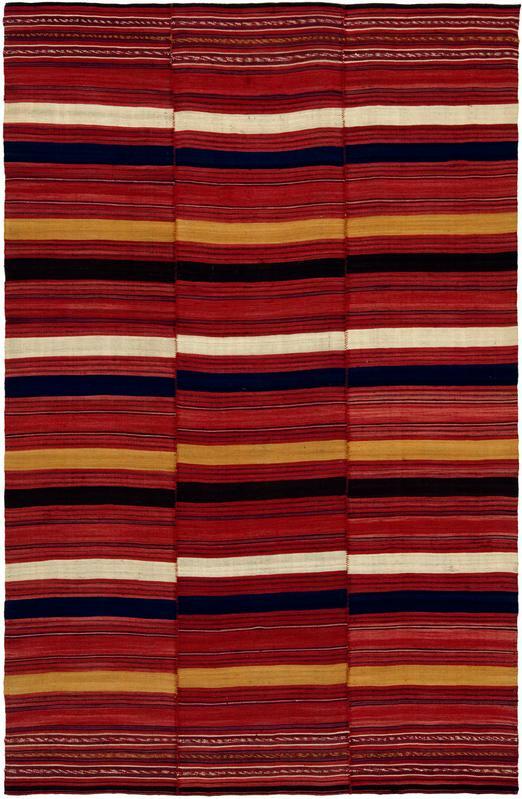 This unusual piece has a design of horizontal stripes or bands in alternating bands of red, black, ivory, and yellow, with additional dark narrow stripes articulating the broader red areas into smaller bands. Each vertical column was woven separately, with the relative width of each band determined by spontaneous improvisation. The various columns were then sewn together and jogged to attain a staggered effect in the bands. As such no two of these kilims are alike, despite the fact they tend to use the same design principle. The modulations in the tonality of each band, with extensive variegation of color or ‘abrash,’ gives each piece a uniqueness all its own, with a distinctive visual texture. The use of multiple colors here, along with the added sewn embellishment in the stripes at either end, is quite extraordinary within the general tone-on-tone approach customary on Mazandaran kilims.